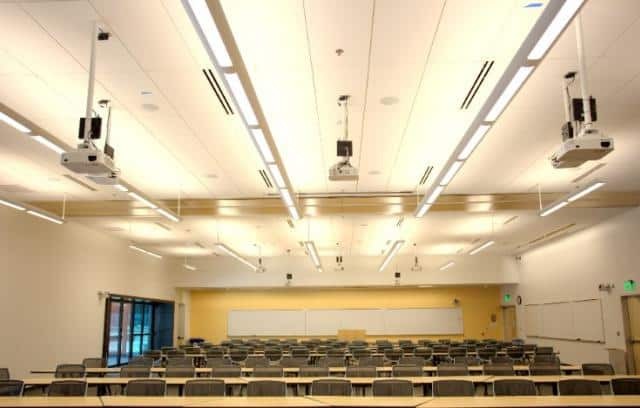 The Academic Building at the University of Colorado Denver campus includes two 150-seat lecture halls, a 250-seat auditorium, many small meeting rooms, classrooms and campus Visitor Center all equipped with digital audio-video systems. The lecture halls and auditorium have multiple video projectors and cameras for presentations and distance learning. Instructor courses are recorded by an integrated Media Retrieval System. Centralized control of the cameras and recording is provided in the Educational Support Services Control Room. Flat panel displays with local AV inputs are available in most rooms for impromptu meetings. DLAA provided AV systems design and acoustical consulting to provide spaces with good speech intelligibility and low background noise levels when the mechanical systems are operating.